Looking down the shops at the Fyshwick markets. 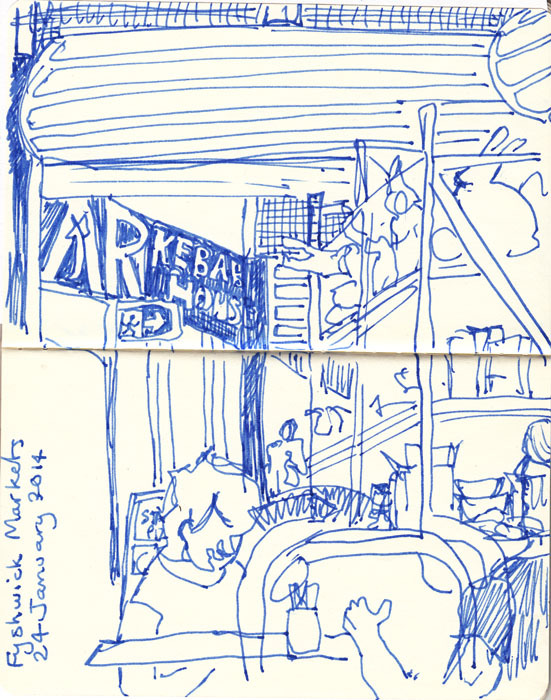 A quick pen sketch at the Fyshwick markets. During the week I visited the nearby city of Goulburn, an hours drive away from Canberra. Goulburn has a lot of architectural heritage on view. If you look above the awnings along the main street you can see a real mix of historic periods. As we were ambling along my friend drew my attention to a number of old neon signs still in place above shops that are no longer exist. 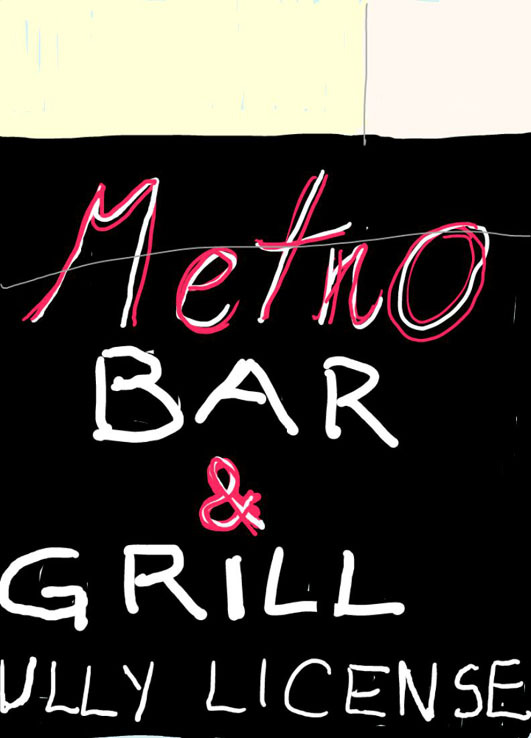 I captured another sign in a quick sketch on my tablet. There was also plenty to see under the awnings. 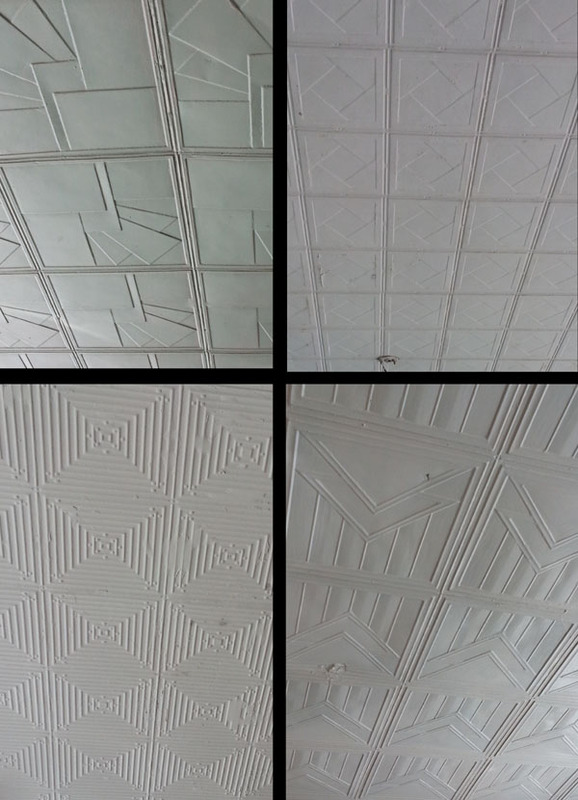 I had never noticed that many of the awnings along Auburn Street were clad, on their undersides, in pressed metal. The ones I noticed all appeared to be in the Art Deco style. 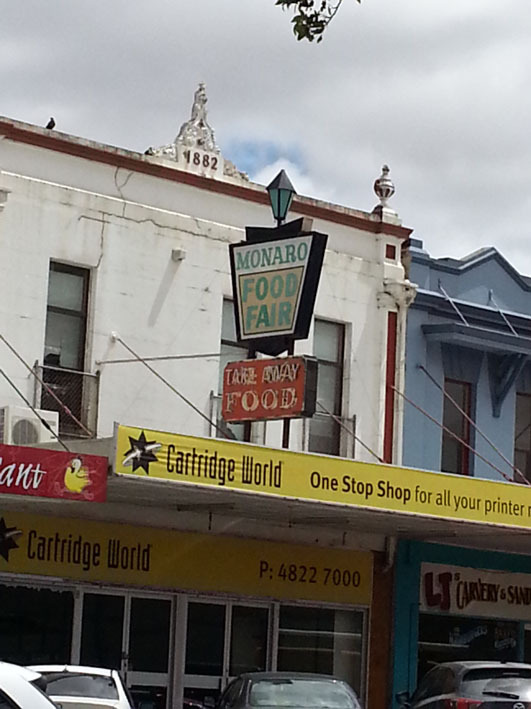 Some of the pressed metal that can be seen on the awnings in Auburn St, Goulburn. 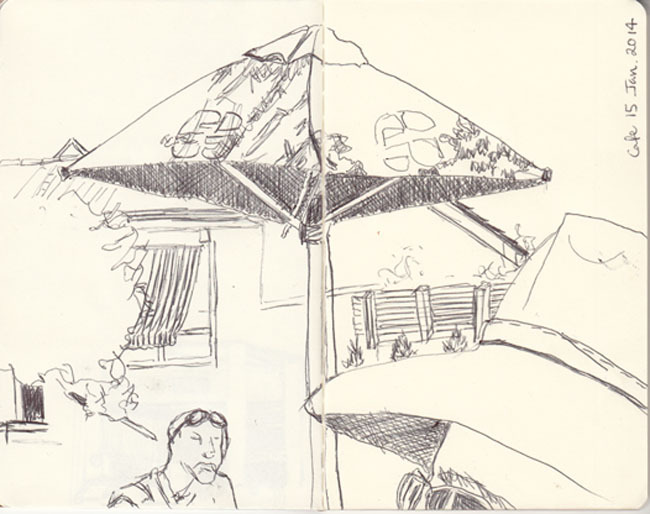 We stopped for lunch at The Roses Cafe where I did another quick sketch. Inside the Roses Cafe, Goulburn. I can definitely recommend Goulburn as a destination for anyone interested in architecture. We’ll be back in Goulburn next week for the opening of the ‘Efflorescence’ exhibition at the Goulburn Regional Art Gallery, which includes one of my works. Hope you can drop in while the exhibition is on. 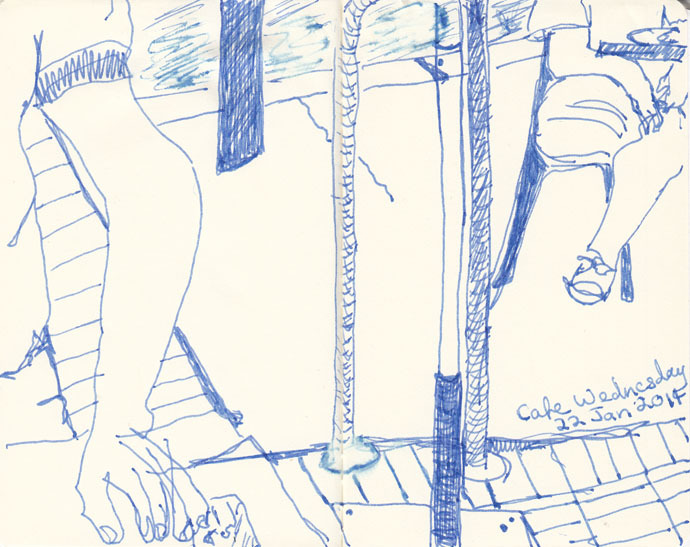 I’m trying to vary my Cafe Wednesday drawings, so looking at different angles is one way to go. The other advantage is that people appear less twitchy when you are drawing their legs, rather than their heads. Our natural instinct to sense when we are being watched is still strong. Cafe Wednesday, a different angle, 22 January 2014. I’ve just taken delivery of the first fountain pen that I’ve owned in quite a while. The boxed set came with ink and spare ink cartridges. Given the ink etc was black I was rather startled to discover that the cartridge in the pen was blue ink. So it’s blue drawings on white paper for the present. 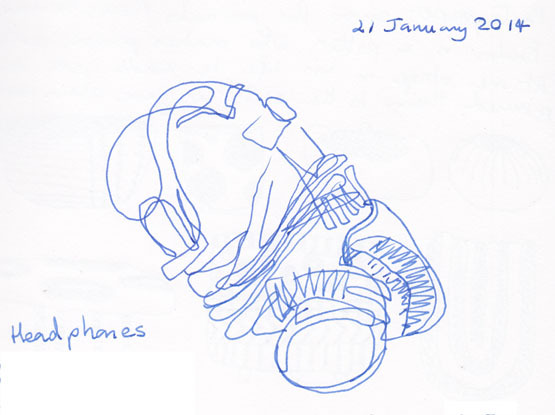 Headphones, ink, 21 January 2014. At some time while I was wandering around the web yesterday I came across a video of the potter/artist/journal keeper/etc Paulus Behrensohn. 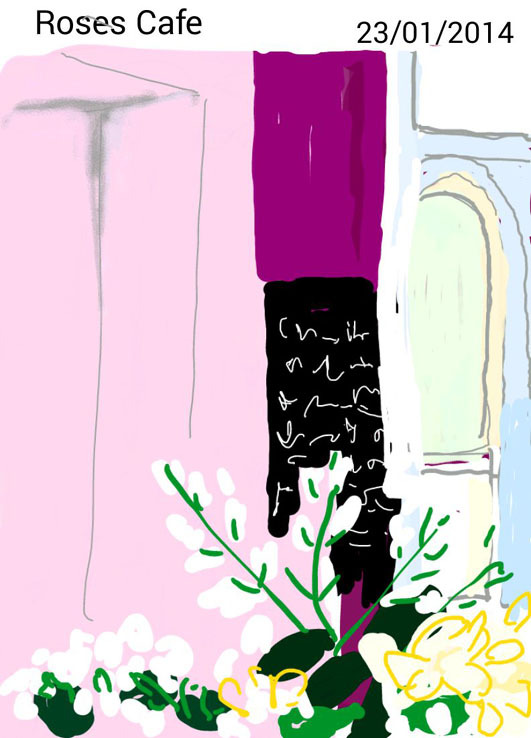 Here was some Paulus-inspired doodling of imaginary pots. 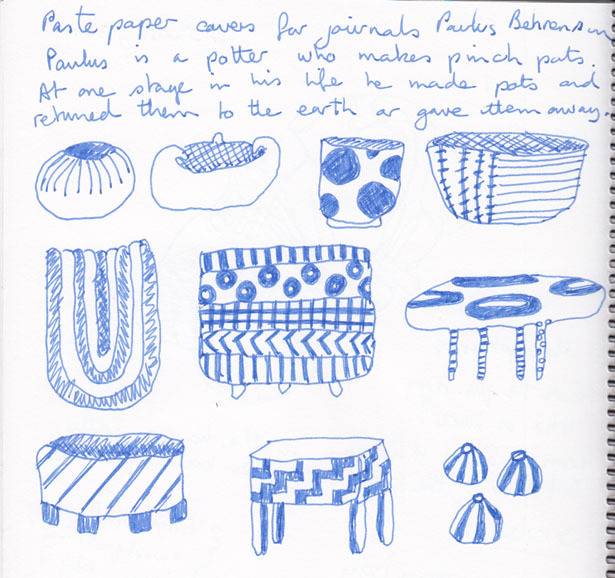 Pots, inspired by Paulus Behrensohn, 21 January 2014. 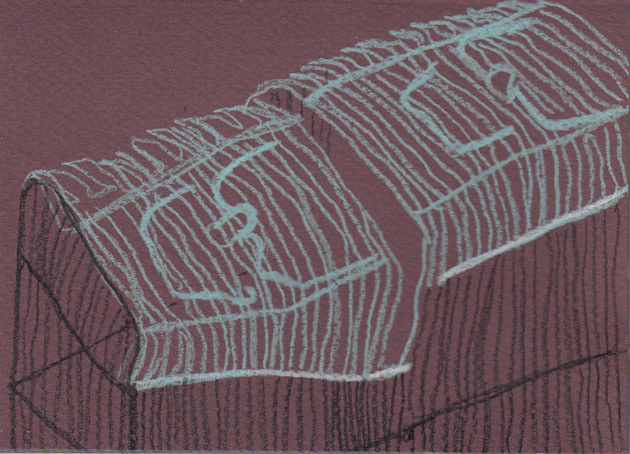 Two drawings involving the idea of flight. The first is a sculpture at the intersection of Summerland Circuit & Drakeford Drive in Kambah. It’s bright orange colour has been the focus of quite a bit of discussion. Moth Ascending the Capital, Alexander Knox, painted steel 2012. 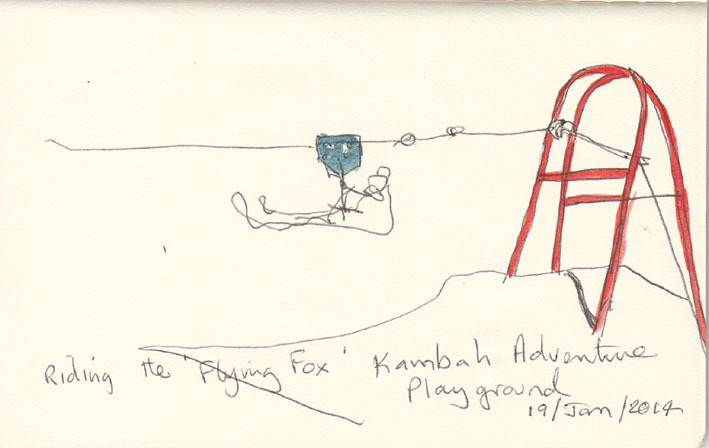 The second was drawn in the nearby adventure playground, where I had the challenge of capturing people riding the ‘Flying Fox’. 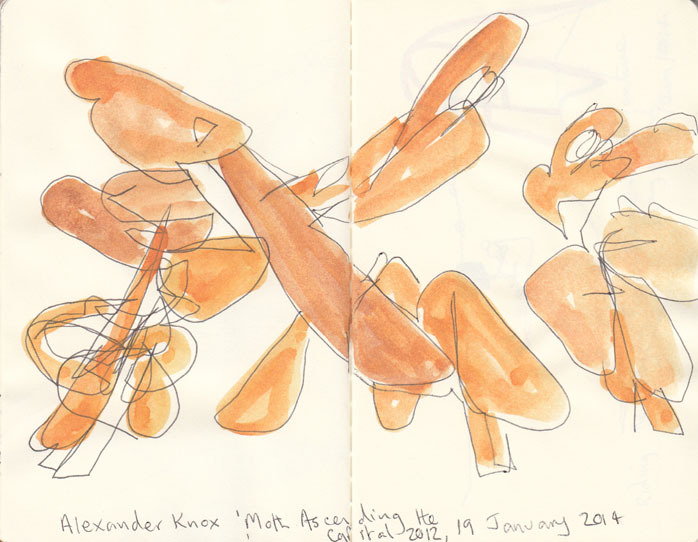 Riding the ‘Flying Fox’, 19 January 2014. A highlight of any week is a visit to the local tip shop, where all manner of stuff gets re-cycled. I’d planned to sit inside the big shed and draw, but got diverted finding pre-loved items for our garden. 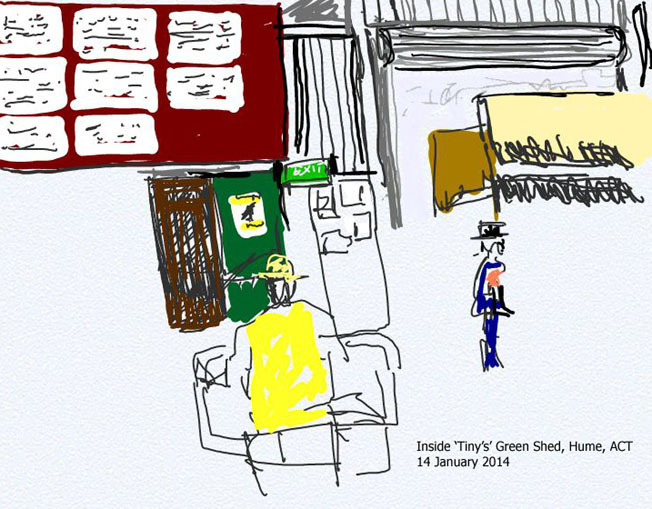 Inside ‘Tiny’s’ Green Shed, Hume, 14 January 2014. Icame home with several items including this weird looking contraption which is actually the top of two bird cages that have been wired together to form a protector that can be placed over plants to save them from the ravages of the local fauna. In our case this is saving our beetroot from being anihilated by our local brushtail possum. Plant protector made from the tops of two birdcages, 18 January 2014. From a drawing perspective I was attracted to the colour contrast between the duck-egg blue wire on top and the black metal on the rest of the cage. The repetitive lines of wire also get the big tick from me. Our regular coffee shop re-opened after the holidays this week. So for my first drawing of the new year at this venue I decided I couldn’t go past my favourite umbrella. At the cafe, 15 January 2014. We went early because the temperature was forecast to reach 40 degrees C (104 degrees Fahrenheit), hence the large hat in the foreground!